These boars can teach Gore: Rank 7 when tamed. This is one of the new pet abilities in The Burning Crusade expansion. The wild ones have an interesting blue mist effect coming from their heads, but unfortunately this does not persist when they are tamed. Mine did come with Dash 2, however. after 1.9 this is now the best pet in the game...when you tame it it has a charge ablity...best pet in the game! Just tamed one and it has 98 fire resistance! I wonder if it will keep it. What levels are the boars? Good for early 50s etc to pickup. Why? Because this seems like the highest boar family mob and boars are amazing money savers. They eat ANYTHING , even conjured &*!@. So everytime u group no more food problems. Charge is better than Furious howl? Why? Because this seems like the highest boar family mob and boars are amazing money savers. They eat ANYTHING , even conjured $%^&. So everytime u group no more food problems. 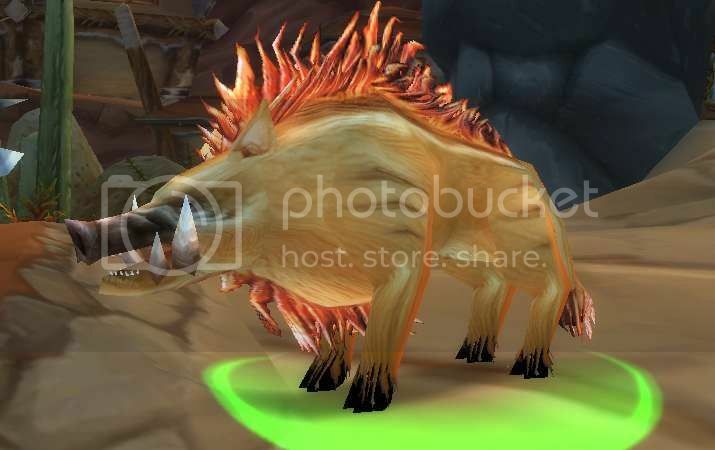 Are there any pictures of this boar, or do they look just like every other crimson boar? so this is the highest lvl bore ther is.. im thinking of geting on for pvp after next patch.. havent tested how good the new charge skill is yet tho.. il be doing that tonight on the test server. I pulled a Widowmaker dagger off of one a couple days ago and when I logged last night, there was a bid of 48G on the AH....don't need a dagger as a Warrior. The quests that require their other drops are decent XP too, so a worthy grind, but be careful of adds and repops in that area! The highest level boar is the Plagued Swine located on the inner west side of the Eastern Plaguelands. It clearly says 43 to 49, I've searched for boars at 43-44 but the only once that I've seen are 47-49. This NPC can be found in Blasted Lands (67).